I've had the best week of teaching this past week – I’ve been putting into practice lots of ideas borrowed from you and other trainees and the response has been fantastic! You have been a wonderful teacher and I admire your successful studio. I have enjoyed working with you and hearing your pupils which has been truly inspiring. Thank you for letting me observe the training. It was so interesting and educational. I am very grateful for the opportunity. Listening to Caroline and Heather was wonderful. I am still on cloud nine. I am re evaluating how I deliver my lessons, from the content, the planning, the choice of repertoire, in the way I address the pupils in voice and manner, to what I say and what instructions I give. Caroline’s talk on managing a studio was wise and sensible and based on experience. It was reassuring and encouraging to hear her advice. Thanks again Jenny. I am very proud, when people ask me, to say that my teacher is you. Teaching your students is a delight. They are so well prepared in every way – and so responsive. They are all a great tribute to you. I am as usual full of admiration for your dedication and enthusiasm. Your students and your trainees are lucky to have found you! Your enthusiasm and dedication are obvious and this will set trainees up securely for the future. It is wonderful to see how the course is flourishing and how inclusive it is with a wide age range, nationalities and no doubt different starting points too. I have learned so much at my first course. Jenny and guest tutors Caroline Fraser and Sue Bird, in their inspiring lessons, enabled me to see piano teaching from a new perspective. THANK YOU! Sue Bird and Caroline Fraser’s examples were fantastic – ideal models! A good mix of tutor input, discussion, practical activity, listening and playing. I love seeing the relationship you have with each of your families when we teach your students. Thank you, Jenny, for taking me on my learning journey and road to recovery. And thank you for all the beautiful memories and friendships you’ve made possible in your studio! Your organisational skills and attention to detail do not go unnoticed and we all appreciate your support, dedication and kindness. Jenny Macmillan is a teacher trainer who has a thorough academic way of introducing teaching points. Her inspiration is lifting the Suzuki-approach to a higher level. Congratulations to you once more for your superb organisation and well thought out course. You are doing such a fantastic job of creating a nurturing community for your trainees, and this is exactly what Dr Suzuki wanted. Your students and parents are a great example of well-trained families in every sense of the word. What a treat for your trainees actually to see your studio in action. This is the best kind of training. Finally a word of thanks to our behind-the-scenes person, Sebastian, quietly and discreetly making sure everything is running smoothly. Sebastian is a true example of Suzuki spirit – recognise what needs to be done before it is stated. Ready to graduate from Matsumoto! I am always happy to come and work alongside you, Jenny. You know I am also a passionate believer in quality teacher training programs. That is why I enjoy coming to Cambridge. You are also doing a great job in forming a strong and sharing learning community! I very much enjoyed your course with your rigorous attention to detail and your devotion [to teaching]. Great balance between teaching, being taught, thinking about Suzuki philosophy and chatting over coffee! Lessons with different teachers put things into a wider context and help develop my individual teaching style. I especially appreciated the input of Caroline Gowers who somehow manages to be exacting and sympathetic, highly organised and flexible, critically frank and positive. Interesting and informative to work alongside different levels. Your session on planning, structure and pacing was very useful. Yet again, the playathon was fantastic and very enjoyable. I love the amazing way you organise the lunch break and provide practice rooms for us. Especially enjoyable was the opportunity to make music with the tutors Helen and Caroline and the other trainees – an enjoyable evening. Thanks for a fantastic January course! There is a great camaraderie in your studio which I could feel palpably. I am grateful to have been strongly encouraged and directed how to prepare beforehand, as it meant I got so much more out of the week. The passion for learning was clearly conveyed by each trainer. I now have a deeper understanding of teaching the finer details of technique within a piece. Am very happy. Thank you for all your training and wonderful work. I met such lovely people on the course. The CST group is like a family: argument, irritation, teasing, but most of all love are key ingredients in the mix. A great balance of doing, observing, discussing, listening. I enjoyed this course a lot. I am grateful for your kindness and your trust in me. I want to do my best and continue my training with you as, each time, I am more sure there could be no better teacher. I am very happy with your teaching. You are aware of trainees’ needs to ensure we are all happy. A big thank you, Jenny, for your patience, organisation and understanding. My motivation and confidence have both been topped up again. It’s been a hugely worthwhile week and I’m looking forward to the January course already. Congratulations on all your good work! Really enjoyed the course - it felt purposeful - wish I'd been able to attend more. I liked the balance of playing, discussing and teaching. The Paul Harris session was excellent - loved it. Really appreciated the longer lunch break with organised practice rooms. For performers, recitals were a good opportunity to play through their repertoire; for trainees in the audience, writing positive comments and then suggestions for improvement was excellent for developing listening skills and mentally going through teaching points. I really enjoyed the two sessions on developing skills through the repertoire. One of the sessions I most enjoy is the guided teaching - that we get so much done in such a short time. As always, thank you for your excellent organisation, your work and your dedication. Inspired after a fantastic week of Suzuki training. Fantastic few days – all of it utterly invaluable. Good balance of expert input, observation and active participation. ​I can’t think how you could improve on this intensive course. Love the soirees and playtogethers! I always finish the courses very motivated and with desire to work better. Thank you, again, for your patience and comprehension, your very good organised training course and, always, for your smile. I am amazed at, and admiring of, the huge amount of work you do; all the preparation and the way you follow through on each trainee and keep detailed track of their progress – all in a very positive atmosphere. They are extremely lucky to have you as their trainer. They are clearly making steady progress in their own playing and general understanding and gaining all sorts of insights as they go along. The excellent sessions each day were varied and stimulating. All presentations were superb. An excellent learning environment. I learned SO MUCH from the course. It will DEFINITELY help my teaching. ​Thanks for another inspiring week. The focus and well-ordered training, along with such lovely people to work with, is the ideal environment. 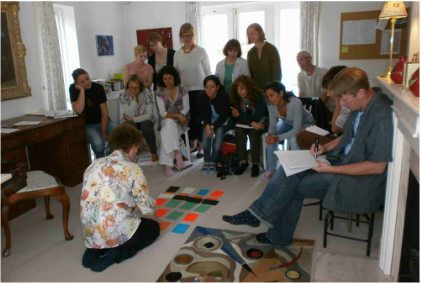 The playtogethers are especially useful for experiencing and trying out group activities. I love the guided teaching exercise. I love how you teach, how you secure the technique and how you deepen the musicality of the pieces. Thanks, Jenny, for another brilliant week. Beate Toyka was a very refreshing thrill! Thank you to Sally Cathcart for her brilliant, fluent and inspirational presentations on Saturday. Lovely soiree, really nice to get to know everyone, and thank you for organising the meal. ​Can’t get enough! Wish the day were longer to squeeze even more interesting discussions into the course! Thank you very much for giving me an opportunity to observe your course. Those six days of experience gave me a very positive energy. Each day was so rich. There was always a positive and energetic atmosphere and successful trainees’ attitude gave me an incentive to (try to) keep up. I deeply feel it was a privilege to attend your course. Observing Caroline Fraser at work is a privilege. This course struck a perfect balance between teacher input, observation, discussion. Thank you, Jenny, for sharing the work of your studio with such generosity, for nurturing me, and for all your hard work! There was a great deal of material I can use in my teaching and a number of principles I can apply. Watching successful lessons gives me confidence to put what I’ve learnt into action. The balance of observation, presentations, opportunity to explore the Suzuki repertoire, discussion and performance was very useful. Inspirational – will definitely help my teaching – Robinson College was a great venue. Every time I go to Cambridge, I come home with new ideas and feel more secure about the philosophy. You always do wonderful work! You are an inspiration to us all! Thank you. 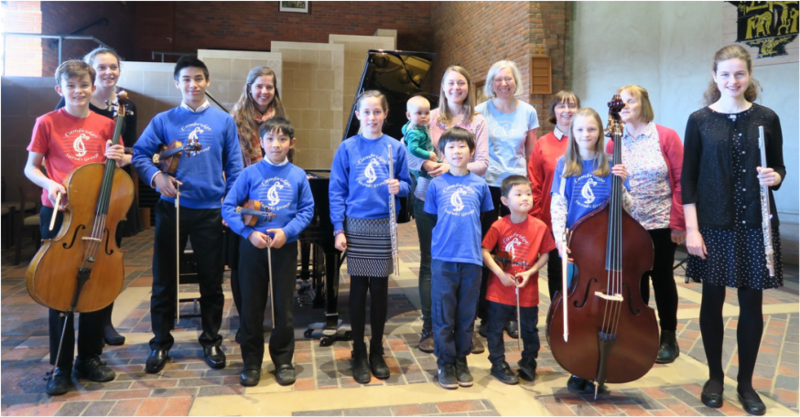 Loved the children's concert - violin, viola, cello, double bass, flute and piano! I wish I could have attended the whole course. I experienced much inspiration and eagerness to learn and teach more, I observed different learning styles in children, I acquired awareness of effective strategies in teaching, praising and motivating both pupils and parents. The training is always excellent. I always come back to a new term’s teaching with fresh motivation for what Caroline Fraser describes as “the best job in the world”. Beautiful, inspiring ideas. I am learning how to look and listen to all the elements of music in the children’s lessons. Always something new to discover. LOVED Polly's Alexander session. It was very encouraging to listen to parents’ views on being Suzuki parents. I felt highly inspired! Thank you for setting up the parent discussion. I think we all found it really good to hear about the Suzuki experience from the parental vantage point. A smaller, more intimate group with some lively personalities made for a group where ideas and practices could be discussed, challenged and reinforced. Calm and wise background consultancy – thank you. Fabulous playathon – what fun! Thank you for organising it. Also lovely idea to have a soiree. I like that we have so many individual lessons. Also great to talk to the parents. The whole week was very thoughtfully and carefully prepared. I did enjoy working with your trainees. I hope the rest of the course goes well. They're lucky to have you! I learned so much from the course. It was wonderful – so inspiring. 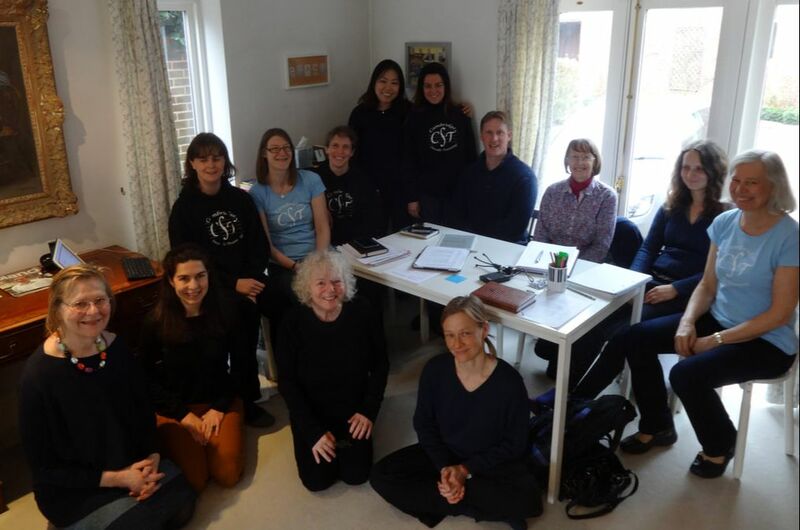 I loved the variety of activities, the well-organised music studio, the punctuality, Jenny’s strong leadership, and the exceptional quality of the two guest teachers, Sue and Penelope. I loved all aspects of the training. It will help my teaching dramatically. Inspiring and interesting to attend training at different levels. Feedback felt nicely collaborative. Suzuki teacher training weeks have become a bedrock of my playing and teaching. Very good value for money – a bargain! I’ve learned so much. The teachers were fantastic, and the organisation, too. Thank you, Jenny. Your teacher training course is the best possible! The session with Penelope Roskell was illuminating. Thank you for everything, including your valuable lessons, and your kindness and hospitality. You are an excellent teacher. I really enjoyed the course. It was all so interesting, and everyone was so welcoming. Thanks for letting us observers join in. It was a real pleasure to meet so many dedicated individuals. I am very impressed by your teaching and the results you achieve by the Suzuki approach. Thank you so much! It was moving and wonderful for me to have such an inspiring time. It was really good to see how your trainees are supporting each other and understanding Dr Suzuki’s philosophy so well. They are a lovely team. Splendid work! Thank you for a truly inspirational week! Lots of new ideas to try with my students. A huge thank you – so inspiring. Caroline is an amazing teacher, especially the way she coaches fine-tuned listening and really amazing tone production. Fantastic. Good mixture of practical and philosophical advice. The wider picture is good. You manage to keep everyone on their toes by involving trainees a lot, getting people to demonstrate things, and the yoga is a very good idea. You’ve given it a great deal of thought, and it’s a great success. Watching highly skilled and experienced teachers I notice all the techniques and ‘tricks’ they use to instruct, encourage and inspire their pupils. I notice their high levels of organisation and a complete commitment to each child as they undertake ‘the best job in the world’. I notice children who feel valued and who want to learn, children who smile while they are learning. I wish education and government ministers could watch – and then join me in falling flat on their faces when, as they try to teach, they realise that expert teaching is not a skill to be acquired overnight. But it is one that can be taught, learned and developed. The opportunity to develop my skills in a community of caring but rigorous people is invaluable. Congratulations on another spectacular course - wonderfully planned and executed! The children and their parents are doing so beautifully. The children had both their lesson and concert pieces so securely and musically prepared. What a marvellous example for the trainees to follow! A good balance between discussion, lecture and practical elements. Inspiration and challenge in equal measure! The Nurtured by Love DVD should be compulsory viewing for all teachers of all subjects. Packed full of information, really motivating, lovely atmosphere and learning environment. Pacing and variety really good. Helping my confidence enormously. I feel like a sponge soaking up all the information. Most interesting for me is that the more I look back at the Suzuki approach to my own piano lessons, the more I find myself looking back over my whole life and seeing how Suzuki affected me as a person in every way – my way of thinking, my way of communicating with people, my way of learning (not just music), my way of teaching (again, not just music) – literally everything. It really is a way of growing up and developing as a person, not just learning how to play a musical instrument. It has been wonderful! I wish I could have stayed for more! I have learned a great deal – lots on technique, expectations, parental involvement, group lessons – a fantastic introduction to Suzuki teaching! I felt really well included in the group. Thank you so much!! As a new observer, I was made to feel much more part of the group than I imagined. I felt accepted and included at all times. I have learned so much this week, not only from the sessions, but also from being with other teachers. This week has renewed my enthusiasm for teaching and I feel more confident. Thank you. Thank you for a very special day. I learned heaps about all those things which really matter about teaching - enjoyed the sessions and was privileged to be there to observe. Thanks for making me so welcome. ​The course was even better than I expected. I’ve learned many things about how to improve my skills as a pianist, and interesting ideas for teaching better. I’m glad I have started my training with you. Thank you so much. It was interesting to watch you teach other trainees and observers, continuing to refine what already looked and sounded to me like pretty good playing. Enjoyed the playtogethers, as always. Juggling great! ​I’ve learned many new ideas for my teaching. Thank you very much, Jenny. Each course I learn a lot to help my teaching. What a great bunch of trainees on the Cambridge Suzuki Training course! I had a wonderful day and I hope the trainees enjoyed themselves as much as I did! Thank you for your kindness and hospitality, Jenny – they are a tremendous credit to you. Thank you Jenny, for an absolutely fabulous course and warm hospitality! Hope to return again! I didn’t expect it to be so interesting, meaningful, eye-opening, useful! Inspirational – I have learned a lot! What a fantastic couple of days I had on your course, the best yet. I thought the enthusiasm was riding high amongst everyone and what a treat to see Caroline Fraser in action. I tried out some of her suggestions today and what a difference! I could play my octaves with so much more ease. Thoroughly inspiring teaching from both of you. Fabulous. Caroline was truly inspirational. We were so privileged to have you and these first class pianists and trainers tutoring us. After years of reading your website, it was so good to have the opportunity to visit your studio and observe your teaching closely. It was a great idea to put yoga for musicians into this professional development course. Thank you for the wonderful and inspiring course. I’m so glad I came (from Australia!)! Thoroughly enjoyed it; learned heaps; varied participants made for lots of interesting conversation. Thank you so much for the great course. It was wonderful. Thank you so much for inviting me to teach over the past few days. It is such a delight to see how your studio is flourishing and that you are attracting trainees like bees to a honey pot!! Your guidance for your trainees is clear and concise. They are lucky to have you. Congratulations on your wonderful course and the supportive community you have created. I needed this course half a century ago, and am happy to have been part of this excellent, challenging week. I learnt a huge amount from presentations, observation and participation. The course introduced new teaching techniques and reinforced familiar ideas (teaching backwards, one point lessons, mosaic). The schedule was full and focused. I thought of you EVERYDAY this week especially when I was teaching. Yes, in almost every lesson!! And amazed by all the pupils who responded immediately with beautiful bunch of bananas with delicious tone for leading to musical phrases. Bliss!! I had so many wonderful surprises. It's all down to you and your wonderful teaching. I'm SO grateful to you, Jenny. THANK YOU!! ​Thanks for another truly inspiring course. I thoroughly enjoyed it. I feel very privileged to have you as my mentor and thank you for sharing all you do. The whole week has been illuminating. I've collected so many ideas which I can work with straight away. I feel as if I've been watching the Rolls Royce of piano teaching and learning and am left wondering if there is a place for the VW Polo and where I fit! Thank you for an unforgettable week, Jenny. Loved the masterclass. Guided teaching session helpful. Loved the Monday evening. Thank you for the fabulous course. It was SUCH a pleasure being there and thank you for making me so welcome. Loved it all. Such lovely and interesting people and dedicated teachers. Thank you for making me so welcome. I really enjoyed meeting you and your students, and found the whole experience very positive. Everyone performed with such a good sense of style and touch! Jenny’s a wonderful teacher and pianist. The course was wonderful, perfect, well balanced in all areas, good value – thank you very much! The course exceeded expectations – it was fantastic! I learned a huge amount, in particular HOW to teach, which most pedagogy courses don’t seem to tackle. The quality and delivery of the course was so good it was worth every penny. I can’t tell you how much I enjoyed the course last week. Not only was the course very inspiring, I felt a warmth from everybody, and part of something very special. Even though I am not teaching Suzuki at the moment, yesterday I was able to apply the enthusiasm, positive attitude and step-by-step approach that you encourage. As a result my pupils all left their lessons with smiles on their faces, were really engaged in their lessons, and eight hours of teaching felt like one! Normally I end a long session exhausted! So I thank you sincerely. Jenny is a fantastic teacher and a brilliant musician, not to mention a delightful person and a real pleasure to know – we can all learn a lot just by watching her work. So positive, so motivatory, loads of ideas and inspiration, brilliantly organised and structured. I particularly enjoyed your practising talk (it makes so much sense) and the session about early lessons. Very helpful. Enjoyed every minute. Thank you very much for the useful, informative and friendly sessions on Sunday. Everyone worked well as an excellent team. The social at the end was a bonus. What a delight it was – you created such a positive framework, everything so well organised, and with the right atmosphere. ​I loved every minute of it.